It’s a beautiful day in uptown Arodhes if a tad windy…a great day for drying the washing. I have been here three weeks and in that time I have been in turn: pleasantly warm in the February sun, rained on non-stop for a week, snowed in, iced out, and hailed on, freezing cold and now back as you were, pleasantly warm in the February sunshine. Such is the roller-coaster ride of early Spring weather in Cyprus. I have been told though that this winter has been exceptionally harsh and prolonged. Maria also studied art in the States after gaining a Fulbright scholarship which stipulates she must return to Cyprus after her studies for a set length of time to work in her chosen field of study.”She is a visual artist, educator and food lover. She has worked in an art museum, a university, an organic dairy farm and a farm-to-table restaurant, among other places. Having grown up in Cyprus, she recalls summers eating under the grapevine, chickens, and other living things her grandfather used to tend to.” So between them they worked out a plan for the future to combine both their loves of food and the land and have after a lot of hard work established the beginning of their dream. Such a project will take time to establish and develop into a thriving business of course but the enthusiasm and perseverance are there. It will take time to get to know both literally and metaphorically, how the land lies, what crops work best which crops take too much labour and which just grow themselves. Already they have discovered that the climate and soil of Cyprus enables most crops to grow vigorously and well, a walk around the plot showed evidence of this with some huge cabbages and cauliflowers that would do well in any garden produce show in the UK. The land is divided up into two sections one where the crops are grown and one that is ear-marked to be more of an orchard. At the moment it has olive trees and some young fruit trees with many roaming chickens and a few clutches of young chicks. A magnificent white cockerel was showing whose boss and strutting his stuff. Amongst the many crops grown and planned to be grown, the crops available to harvest at the moment are :- cabbages, cauliflowers, chard, Cavalo Nero or Tuscan cabbage, some beautiful tender stem broccoli, enormous fennel, kale, parsley, radichio and eggs. Every Saturday morning they open their doors to the public to allow them to come and buy this great produce. Check out their website Parhelia for details of where they are and times they are open. 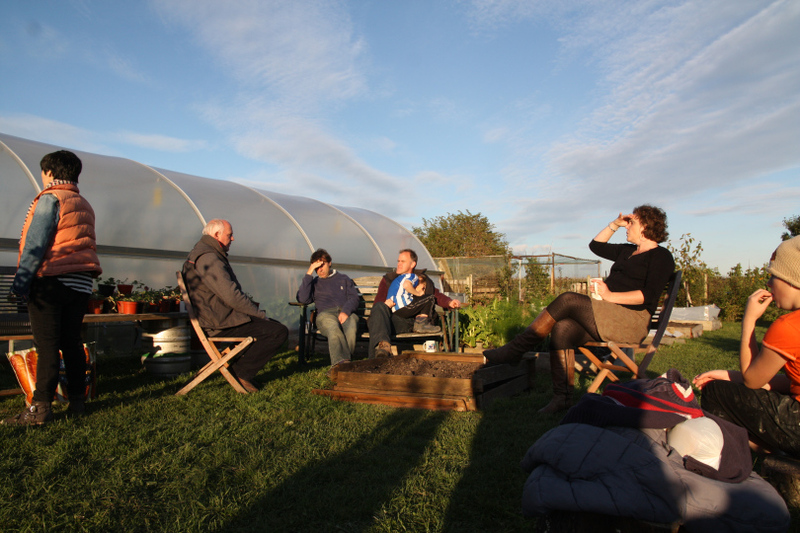 As my regular readers will know, in the UK I belong to a community garden and whilst talking to Peter as we walked around the vegetable plots, I realised how much I had learned during my time there. Happily chatting about using liquid nettle feed and natural ways of deterring pests, recognising the crops common and not so common. We sat happily chatting in the sunshine talking of their plans and eating the delicious kataifi made by Maria’s mother as part of the Green Monday celebrations. In Cyprus now there are quite a few small groups of people who are keen to move in a different direction to the focus of the majority and in a way go back to the roots of a way of living that, until very recently, was the norm all over Cyprus. In so doing they bring with them techniques and knowledge which will enable a better, healthier way of life without the hardship of previous generations and a much more environmentally and ecologically sound way of living on the land and working in harmony with nature. This island has so much potential in terms of its younger generation and riches of the land, I believe the future is very bright. I hope in my own very small way I can show examples of what is happening and showcase the people I get to know about and meet and in so doing promote Cyprus. Pater and Maria admit is isn’t easy but they knew it would be a challenge maybe the reality was harder than they imagined but they are here and doing it. 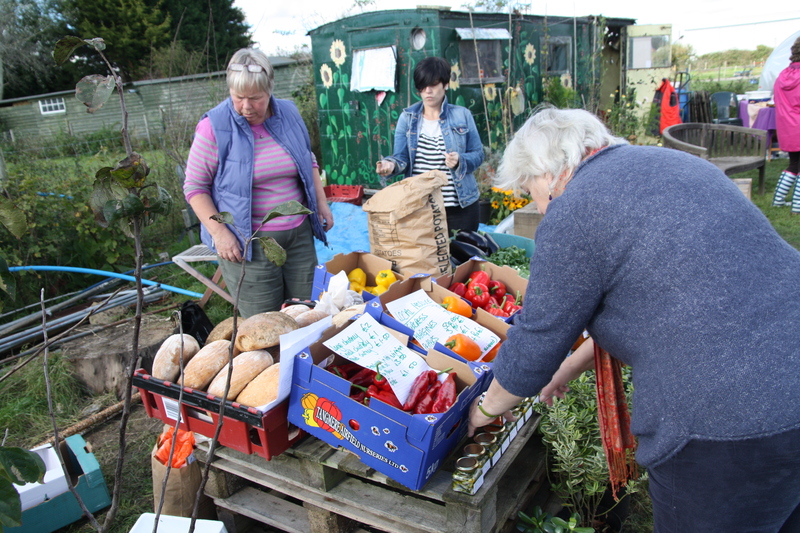 Please support them by visiting on a Saturday morning to buy their beautiful bounty, the crops are ever changing, broad beans, peas and artichokes are on their way as well as many more crops when in season. 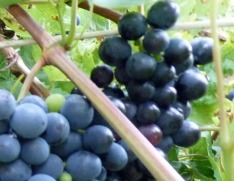 In Cyprus it is the grape harvesting season and even here in the UK near where I live we have vineyards. Just in the next village there is a vineyard, Tinwood, producing sparkling white wine and delicious it is too. 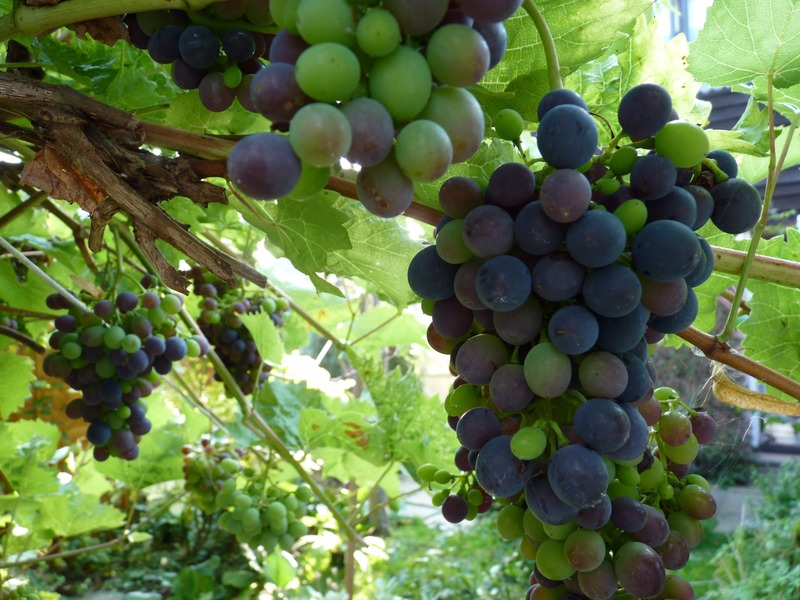 I even have a vine at the bottom of my garden which this year is laden with ripened grapes. Last year, I guess because of the awful weather the winter before, I got very few but this year they are back to abundance. Because we had a lot of sunshine this summer, a phrase I’m sure you who live in Cyprus will puzzle over – summer surely that is always sunny? – the grapes are nearly sweet, that is to say they are certainly edible without having to screw your face up into a grimace. So this year I have been juicing them to make a delicious drink which I am sure must be packed with goodness. In past years when they didn’t achieve optimum ripeness I used them by crushing and then cooking and straining out the juice then adding a little sugar and lots of garlic to make a thick sauce I could keep and use to add to stews for extra richness. I have also made chutney with them, I have used a pear and grape recipe which was very good.I always leave some for the birds as I so enjoy watching the starlings descend in a squaky,, noisy raid to gobble them up. In Cyprus however there is far more choice as there is a positive cornucopia of grapes and not just wine is made from them. My favourite product is soujouko or shoushouko, that strange looking string of knobbly sausage that hangs on a washing line all over the island this time of year. Do not be fooled by its appearance it doesn’t look like it but it is a delicate morsel fit for any a gourmet. When bitten into it reveals a delicate sweet fragrance with that nutty centre. In it’s purest form it has no sugar added and is as healthy a food as you could wish for. The ingredients are pure grape juice with a little added flour to thicken the juice and make it more manageable. It is my favourite sweet better than chocolate. In Omodos on my last trip, Androula took me to a shop filled with local yummy delights and there were small packets of two types of shoushouko, one was made with pomegranate juice and the other traditional grape and they were both a delight.Watch out for it next time you go. I am very late posting a new blog I know. All I can say is gardening has dominated my days lately but the end is in sight I hope. My garden now is fairly mature and many of the bushes are very large and need a good purge. You turn your back for five minutes and they seem to grow exponentiallly but armed with secateurs, long-handled loppers, hedge trimmer and a tree saw I am fighting back and so is the rambling rose I might add. On my last visit to Cyprus my friend Elena Savvides of Orexi catering fame in Droushia took me to see her friend who keeps a goat herd near her and makes her own halloumi and anari the staples of the Cypriot diet for centuries. The farmers traditionally and farm workers would take a chunk of halloumi and piece of bread with some olives for their lunch in the fields, their equivalent to our Ploughman’s lunch in the UK. This cheese is used universally as it is the main cheese of the island and is much loved, there are other cheeses, the kefaloturi and kaskavalo, but halloumi is the most used, no house will be without it. It is delicious grilled and torn over salad. At Easter the beloved flaounes are made using a special halloumi. We travelled down a winding dusty track to the middle of nowhere it seemed to meet the lovely lady Koula who was in the middle of milking. Her son was helping her at the milking machine which holds eight goats at a time with the odd kid sneaking in for a feed. They have a herd of 4,000 goats so you can imagine it takes a couple of hours to complete and it’s done twice a day. Each goat doesn’t yield too much milk so that is why so many are needed if you are making halloumi on a commercial scale. Koula loves her job and loves her goats, they are a particular favourite of mine and some of these goats were beauties in my eyes. There are a few months at the end of the year when the goats are not lactating but otherwise it is a daily round of milking and making cheese. Her husband helps with the goats and goes up to the Akamas to collect salt from the rock pools to use in the making of the halloumi, so you see this is a very organic operation. When the milking was finished I was invited to a cup of coffee and homemade biscuits in the parlour as it were, where Koula takes a break, she showed me the process of the milk being piped through from the milking ‘parlour’ straight into a huge stainless steel pan where it has rennet added and heated and stirred until the curds and whey form. When I left, Koula very generously gave me a huge piece of anari to take with me which I enjoyed with my cousin Christina later who poured some very good carob syrup over it. What can I say, heaven on a plate! You can ring Koula on TELEPHONE 99820778 OR 99058570 TO PLACE YOUR ORDER. I’m sorry to introduce the big C word at the beginning of December but marketing tactics demand that I think well ahead about these things. Marketing isn’t one of my favourite things and I find myself procrastinating rather than getting stuck in. Everywhere you look there are craft fairs and markets and I feel a bit like Cinderella. I have been half -heartedly planning an advert on Facebook but find the details a bit daunting (if not downright boring). On a more enjoyable side I have been reflecting on some of the contacts I made when I was in Cyprus to do my promotion in April.These have turned out to be good outlets for the book and interestingly they all are related to food but I suppose not surprisingly. One is a caterer and supplier of home made preserves etc. another is a baker and a couple are cafes. The book seems to sell well in these environs. I find myself wishing I could be there in person to attend various craft markets and do my own selling, far more enjoyable than working out an online strategy. The most fun thing was playing around with images to give them a personal appeal like Santa’s sleigh above. Also Santa’s little helper below. After a festival weekend a couple of weeks ago, last weekend I had garden centred frolic. 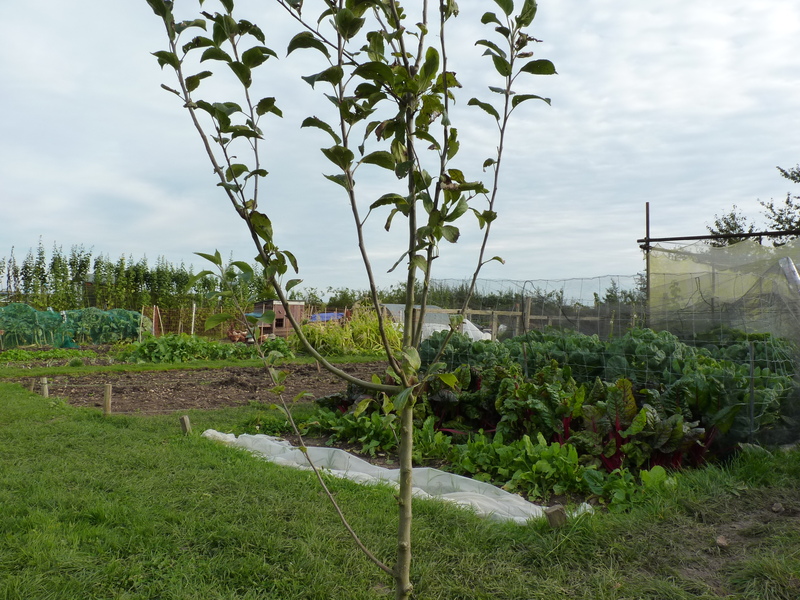 The community garden I belong to has a couple of open afternoons a year where we all bake a few cakes, open the garden to the public and invite them to have a cup of tea and a slice for a small donation. We have a tom bola and sometimes a raffle to add to the jollity and usually we get a good turnout which boosts our funds to pay for any new equipment and materials we might need. Last weekend as it was men’s finals at Wimbledon on the Sunday we made it an open morning so as not to clash. The weather was perfect and all available umbrellas and gazebo’s from member’s gardens were brought into service. I donated a couple of copies of ‘Androula’s Kitchen’ for the tombola and made my version of Revani that’s written in the cake section, for the cake stall. My good friend Gill of Paisley Pedlar fame has raved about this cake often and seems to find any excuse to make it, in fact she bought a new oven recently and the first thing she baked in it was Revani tis Sonia now that’s dedication! I also made some fig slices, I was looking for a very quick recipe using dates and found one online but realised I only had figs in my cupboard so these were duly substituted and I have to say they were a winner. The copies of the book were duly signed for the lucky winners. 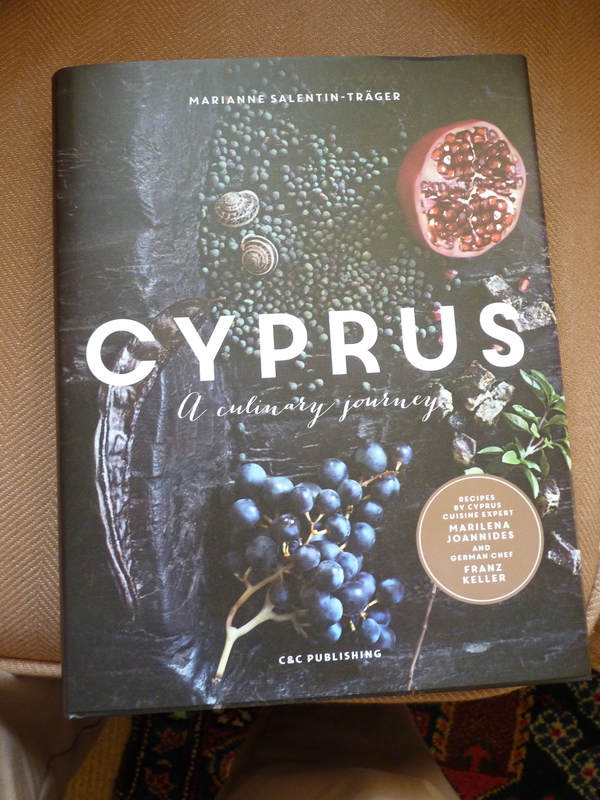 If you want a chance to win a copy, a lucky draw is ongoing at the moment on the Eugreeka website http://www.eugreeka.com/cyprus-on-a-plate it’s open to any one until 18th July and the winner will be announced in the newsletter out on the 19th July. The same weekend, one of the member’s had a milestone birthday, it seems to be the year for them , and invited a few of our members to a birthday bash in her garden, and very lovely it was too. I have written before about my love of cake and last Sunday I was in cake heaven. 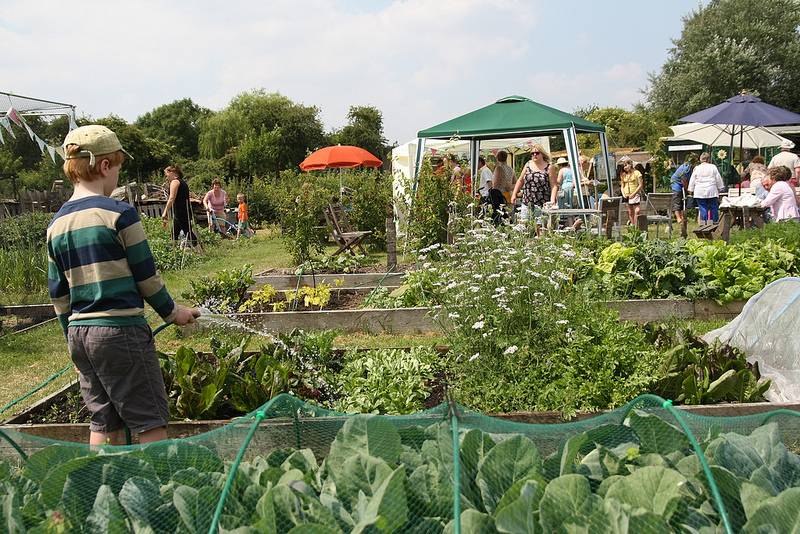 A couple of times a year we throw open our gates to the general public and have open days down at our community garden. This helps us raise funds for garden tools, compost, whatever is needed for our projects. The members make cakes and sometimes pickles and jams are brought to sell. Our driving force Rosemary, a food activist and writer, brings bread from a local artisan baker and some local veg to sell. 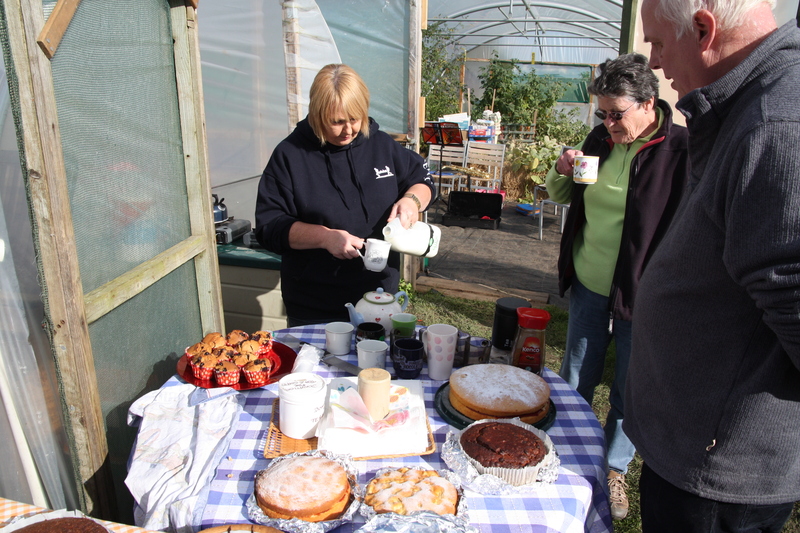 We make lashings of tea to wash down the delicious cake and ask for donations. This works very well and we have the added attraction of a tombola and of course a leisurely stroll around our little bit of heaven. We were very lucky last week as we had the added advantage of the sunshine to bless our afternoon. The tea stall was very busy and we had a huge variety of cakes. One of our members Rita, is a grand cook and made five cakes. Two huge Bakewell tarts, a couple of fruit cakes and a carrot cake.There were muffins and flapjack and biscuits and Victoria sponge, the tables positively groaned. I made a sticky ginger parkin, my mum’s recipe, with a twist. I took inspiration from a recipe I had seen and added stem ginger in syrup to the usual mixture.When it was cooked,I added another innovation taken from the Cypriot method of using syrup on cakes and poured over some liqour from a marrow and ginger jam I made. It was a winning combination and one I will repeat. I also tried out another recipe I hadn’t used before and made some sticky Chelsea buns. These are made with a sweet dough and have a cinnamon and currant mixture sandwiched in and a soft icing. These had the added advantage of using cheap ingredients and also proved a hit. We have recently had some new members join us and one of them is Czech, she brought along some little fruit pancakes which were a tasty novelty. Another member is Spanish and doesn’t bake but she brought along several jars of anchovies preserved in oil which she had prepared herself. These proved delicious when I sampled them later. It was a lovely afternoon and a good way to see the Autumn in and the winding down of the garden. I still have a few hundred onions to plant and garlic but I’ve been laid low this week with aches and pains and a cold. I will recover my stamina and then tackle the task ahead. I will possibly comfort myself with a slice cake!! !